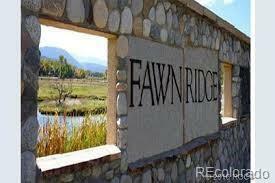 Beautiful building lot in the prestigious Fawn Ridge development. Incredible 360 degree mountain views on a ready to build lot for your Colorado Mountain home. Views of the Collegiate Peaks, Mt Princeton and Buffalo Peaks to the north. Perched up high to take in the views which also include S mountain and the evening lights of downtown Salida. Electric and phone to the lot line and a augmentation certificate included. Driveway and building site completed. Prestigious homes have already been built on most of the lots in this lovely subdivision. This is only one of the two lots remaining where a home has not been built on yet. Covenants to insure the subdivision remains pristine. This is the only lot available to purchase. Minutes to downtown Historic Salida and the Arkansas River. Hiking, biking, fishing, skiing, rafting are all available near by. Small town living at it's best.